Content marketing is a frustrating business. Not only is it time-consuming, but there’s also a lot of conflict regarding best practices, even among industry leaders. Want to hear something that may make you even more confused? It’s difficult to determine exactly what you should focus on since there are varying degrees in the mix of quality, quantity, and promotion. At the end of the day, all that matters is that people are reaching your website and converting. Results: That’s what content marketing is all about. Frankly, there are many, many ways you can go about this and still be successful. (Along with many ways you can fail). For example, HubSpot is a content machine, churning out content every single day, whereas Brian Dean of Backlinko creates only one piece a month. Yet they are both successful!? What should you do? We can focus on best use cases for particular industries another day. Today, we focus on a vital element of the content marketing mix: content promotion. The problem many bloggers and small businesses have is that they create the content, pouring hours into it, and then let it sit. And maybe they do this everyday. They publish well-crafted articles for their niche, but fail to let anyone know about it. This means they not only have quality, but they have quantity. This is great. Eventually, they’ll start to get organic traffic from Google (hopefully). But how can they boost traffic without relying on SEO? Time for some content promotion. I’m sure you know a thing or two about content promotion, but this article is a deep dive into all the strategies you can test out. Ask for Quotes – Influencers can really help spread your content, but they’re busy people. If you want them to take part in a piece of content, but they don’t have the time, just ask for a quote instead. This will make it easier on the influencer. Plus, they’ll most likely still want to share the piece of content once it’s published. Ask for a Share – Have a well-written case study, or a beautiful infographic that you know will get love from readers? Reach out to a relevant influencer and tell them why your piece can help them and their community. Pitch on LinkedIn, Twitter DM’s, email, etc. Get creative to stand out. If you’re just starting out, aim for micro-influencers that can help spread your message. Over time build additional connections and move up the chain to more sought after influencers. Mention Companies/Influencers in Your Content – Instead of asking for anything upfront, simply add in relevant info and mention the company or influencer that shared that info. Make sure to link back to the original source. Then, reach out and let them know. This works great when citing statistics and controversial opinions. And influencers will like it because you already provided them upfront value before asking for anything. That’s a recipe for reciprocity. A quote by Derek Halpern that appears in an article on content promotion by Sujan Patel. Share on brand/company profiles – Ok, this is obvious. But, there’s one more step here that is very important (and often overlooked). If you’re sharing something that isn’t time-sensitive, continue sharing this evergreen content in the future. Don’t worry about bothering people, just keep sharing the content over time and mixing it in with your newer content. Why do this? When you share a piece of content on Twitter or another network, basically no one sees it. The only way to fix this problem is by sharing a whole lot more. Try a service like MeetEdgar to consistently re-share content so that your followers actually see it. Share on personal profiles – I’ve noticed that many people don’t share content on personal profiles for fear that their friends will have no interest in their content. Although this could be true, you’ll most likely gain followers that are interested in your niche over time. You may as well supply them with content that they’d be interested in. This can also be effective as a personal branding strategy. Don’t be afraid to let people know what it is that you do. Create Snippets for sharing – This ties into the two points above. The idea here is to extract snippets from your content to use when promoting the piece on social. Try taking out quotes, statistics, changing the headline, etc. This way you can create fresh posts for old content and drive more clicks. Test out tools and plugins like Revive Old Post, Tweetily, Evergreen Post Tweeter, and Buffer to share old content easily. Tag People/Companies – If you mentioned an influencer or company in your content try tagging them in your social posts. This increases the chances they like and re-share the content because it makes it a lot easier for them to do so. Furthermore, when your followers notice that an influencer’s opinion is included in your piece, they’re more likely to click through. Auto DM’s – One last way to promote and drive more social traffic: Try automatically direct messaging your new followers with your most recent piece of great content. These can be pretty annoying because everyone knows that it’s a robot messaging them and not a person. But if it drives clicks and your content is valuable, might as well try it out. Furthermore, there are many services that offer this feature for free, so take advantage. Promote in Groups – Facebook and LinkedIn can offer perfect communities to share content with their “groups” feature. Join relevant groups and provide value to develop trust. Perhaps start by sharing content within the platform or on a Google Doc rather than just sharing links to your blog. You’ll notice that there are a lot of groups filled with spam. These places are just a place for people to throw links and the engagement is terrible. Instead, find quality groups and interact with the community. You’ll notice that people will be more willing to like and comment on your posts, along with check out the content on your website (especially if it’s valuable). Shared similar content – No matter how amazing or unique your piece of content is, there’s likely similar content out there on the web. (Lots of it) The key is to find people that enjoyed that “other” content and decided to share it. They may be interested in your content and decide to share it as well. To do this, use a tool like BuzzSumo to find all the people and companies that shared particular pieces of content. Or use search features like Twitter Search to find the content that has been shared and the people who did the sharing. Now, reach out to these individuals and companies and let them know what you have to offer. How is your piece unique? How is it better than the other piece they shared? Use BuzzSumo to find people that shared similar content to yours. Linked to Similar Content – If someone provides a link to a piece of content, they must’ve found it very valuable. In fact, a whole lot more valuable than a social share. You can find who linked to content using Ahrefs or Open Site Explorer. Once you do so, it’s your duty to reach out and explain to them how your piece is superior to the similar piece of content they linked to. Since links are more valuable than social shares, you should expect this to be more difficult to execute. It’s worth a shot if your content is an extremely valuable resource. 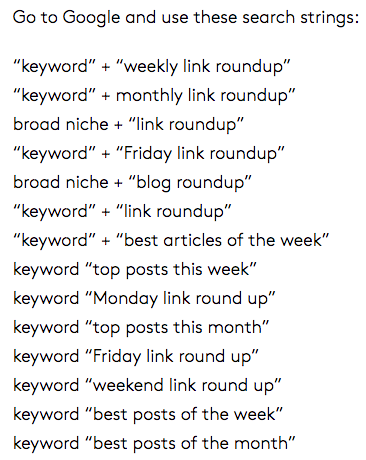 Possible Google queries from Coredna’s Content Marketing Guide. Then, reach out and share your content with the editors in hopes of making it on the roundup post or newsletter. For example, the first month my blog was active, I reached out to AdEspresso and check out what happened below. It’s important to know that you don’t have to be a dominant online force to create and promote value. Published relevant content – When people publish content similar to yours, it presents an opportunity for you to reach out, connect, and hopefully earn a link to your piece. To do this properly, it’s best to get in touch with these authors as soon as their piece of content goes live. Get prepared by setting up alerts with Google Alerts, Talk Walker Alerts, or Social Mention so that when someone publishes something relevant, you can reach out to them for that precious link opportunity. Republishing – In an effort to increase the reach of your written work, you can republish the content on other platforms such as Medium, Quora, and LinkedIn. With video content, you could try other networks like Vimeo. You can even submit your PDFs to sites that offer that as well. With some tweaking, I could republish this article as a Quora answer. Repurposing – Just like recycling, take your old content and turn it into other forms. For example, you could take an informational article and repurpose it as a video to publish on Youtube, or if you have a Podcast, turn it into audio format for your listeners. Or better, start with video and pull out the transcription, make a slideshow out of it for SlideShare, etc. If you’re going to put in the effort to create an amazing piece of contentin the beginning, you may as well leverage that piece to the best of your abilities so that you can share it on all the platforms your target audience enjoys. Syndicating – Months after you publish on your own site, syndicate the content on others’ blogs to increase the reach and exposure. Often this is presented as an opportunity after developing a relationship with other bloggers, as they usually are seeking original content. Make sure they use the SEO tag rel=canonical to attribute the original work to your own blog. By doing this, you won’t get penalized for duplicate content. Email List – This may be quite obvious, but let your email list know about the awesome video you made, or the interview you did with that cool guy in your industry. You have put in a lot of effort to build an email list, so you might as well use it to its full advantage. If anyone is a fan of you and what you do, it’s these people. They’re more likely to share your content because of the relationship you’ve developed with them. Internal Links – Most likely you have some high performing posts on your website. Or perhaps you created a few YouTube videos that have earned a majority of your channel’s views. (Congrats!) These pieces already have the most organic traction, which can be leveraged to promote your new piece of content. If any of these pieces are relevant to the new piece you are publishing, make sure to link from that older, high-performing piece, to the new piece. This is not only to drive clicks from the older piece, but also to establish this new piece as keystone content from an SEO perspective. Encourage sharing – This one’s quite obvious as well, but leverage your readership by giving them an opportunity to share your content. Use Click to Tweet to share quotable snippets, the Pin it button to share visuals with the Pinterest community, Image sharer from Sumo. And, of course, social share buttons so that the entire piece of content can be shared on social channels. Advertising as a whole – As part of your content promotion strategy, you might choose to use online ads to increase readership, especially in the beginning when you don’t have any traffic coming to your website. Display – Using the display network, you can create ads that appear on various websites across the internet. Social Media – You can promote your content with ads via social networks such as Facebook, Twitter, LinkedIn, and even places like Quora and Reddit. SEM – Using pay-per-click (PPC) or cost per thousand (CPM), search engine marketing allows you to advertise based on keywords used in search queries. Native – These ads are the sponsored lists that are included within blog posts, social feeds, and other internet platforms. You can enable native ads through networks like Outbrain, Adblade, and Taboola. Video – Promote your video content with ads on Youtube and other platforms that support video such as social channels. Relevant – Submit only your best content to relevant communities within your niche. For example, I may submit a piece such as the one you’re currently reading to Inbound.org or GrowthHackers. Make sure to partake in these communities rather than simply using them to submit content of your own. Interact, upvote, and submit other people’s content if you decide to invest in this as a content promotion tactic. General – You can also submit content to more general platforms such as StumbleUpon, Google+ Communities, Blog Engage, and more. Depending on the content form, you may want to take note of the type of community you’re submitting to. Great infographic? Try Visual.ly. Awesome PDF? Try Scribd. A quick Google search will bring up relevant communities for the content you’re trying to promote. You have a valuable piece of content that took you hours to create. You know your target audience will love it. You figure that they’ll show up at your doorstep (aka. website) to check it out for themselves. The problem: Nobody told them to check it out. That’s where content promotion comes in. Use the above list to test out content promotion strategies and see what works best for you. Or just download this free checklist that you can print out. The idea is not to annoy people by spamming them with links to mediocre content. In contrast, you have the opportunity to offer a piece that will be of great value to the person or community that you are promoting it to. If you’re doing this, people will thank you for cold emailing them. If not, they may request you remove them from your spam list! The more value you provide in your content, the more successful your content promotion efforts will be.